The gameplay in Super Haunted Insomnia Tower involves a tall building and the act of continually making your way upwards by jumping off floating platforms. It might be useful to note that the screen wraps around, because at times a jump in the opposite direction might be much easier to execute. 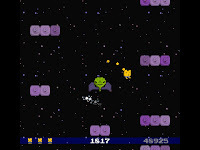 Use the arrow keys to move about, and press the space key to leap into the sky.